If you have the flexibility to fit a gable roof model in your backyard it will give you more room to work in your shed and for storage. In this particular shed the ridge beam forms an integral part of the construction and increases strength and stability. Gable roof garden sheds are the most popular free standing sheds on the market. 2 x 0.75m wide double braced hinged doors give you easy access via the 3.75m side. 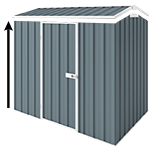 This medium size storage shed provides you with large enough room to store all your gardening equipment, lawnmower, bikes and the kids' toys. Please check out the accessories below that you can add to your shed to customize it to your needs.